By Daniel Horowitz--Four year old Jack is thrilled that he gets mail now too, just like his cousin in Thornhill. But, it’s not just any mail that Jack looks forward to receiving each month, it’s a PJ Library book, in a big blue and white envelope, addressed to him. Jack and his family are just one of 3,300 young Jewish families in our community who have taken advantage of this unique Jewish identity program, and receive free, Jewish themed books every month as a gift from the Jewish community. PJ Library, the international award winning outreach program, was first brought to York Region in 2010 by UJA Federation of Greater Toronto. Now, thanks to additional funding from generous local philanthropists, UJA Federation and its Centre for Jewish Education’s WOW! Toronto initiative, PJ Library is able to expand the program to include Toronto and Peel Region. To celebrate the expansion, PJ Library is hosting Judy & David’s Chanukah Live! 2013, a special family concert featuring the Juno award-winning duo, on November 24th. For Judy & David, who are also the stars of CBC Kids new hit show “Jiggi-Jump”, it will be their first performance in downtown Toronto in years, and they look forward to welcoming families across the city. To add to the celebration, PJ Library founder Harold Grinspoon is expected to attend the event to see in person his legacy come to life. Grinspoon started PJ Library in 2005 in Massachusetts and has seen it grow to over 190 communities in Canada, the United States, Israel, Australia and even South America. 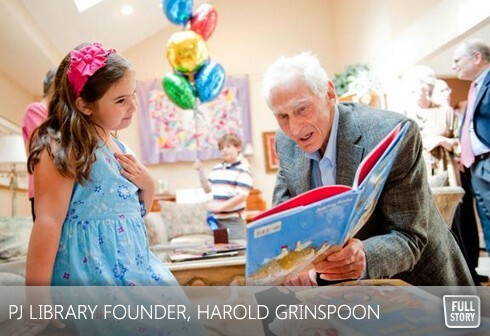 Last year Grinspoon hand delivered the 3-millionth book to a lucky little girl in New Jersey. ”We are so pleased to be able to offer these wonderful books across our community,” says PJ Library Coordinator Elyse Tytel. PJ Library books, by well known award winning authors like Toronto’s own Aubrey Davis (Bagels from Benny, Bone Button Borsht) and Leslie Simpson (The Shabbat Box, A Song for my Sister) are the spark that may help start a Jewish discussion at home. According to PJ Library parent Elyza Polsky , the concept is working. “My daughter is always very excited when her book arrives from the PJ Library. We usually have to read it right away and then again at bedtime. She is able to connect the stories and themes she hears about in the books to things in her day to day life. It has allowed for some great conversation in our house." The books are reinforced by PJ Library programs and events including story times, holiday parties, community events and more. These events celebrate Jewish holidays and festivals, and bring families together according to PJ Parent Dana Lanco. Tickets for the upcoming concert and information on how to register for families with children 6 months-5 ½ years with at least one Jewish parent is available at www.pjlibraryToronto.ca or by calling 416-621-5675.